Officials are searching for more than 1,000 missing people in Northern California after the Camp Fire all but destroyed a community of about 27,000 people, The New York Times reported. The missing persons list has fluctuated from about 100 people to its current size since Wednesday. The Camp Fire caused massive damage to the Butte County communities of Concow, Magalia and Paradise where many of the missing are from. Paradise took the worst of the damage and is about 95 percent destroyed. The Butte County sheriff has added people to the list based on calls received since the fire began on Nov. 8. Officials hope that by making the list public, though it is rushed and incomplete, will cause people wrongly classified to take call in and take themselves off the list. Officials found 330 missing people and removed them from the list before the latest draft was published. Many names on the list may be duplicates or of people who lost their phones and have no way of being contacted. The Camp Fire is the most destructive wildfire in terms of buildings destroyed in California history. The fire has wiped out more than 12,000 structures. It had burned 146,000 acres and was 50 percent contained by Friday evening, according to the state fire agency Cal Fire. 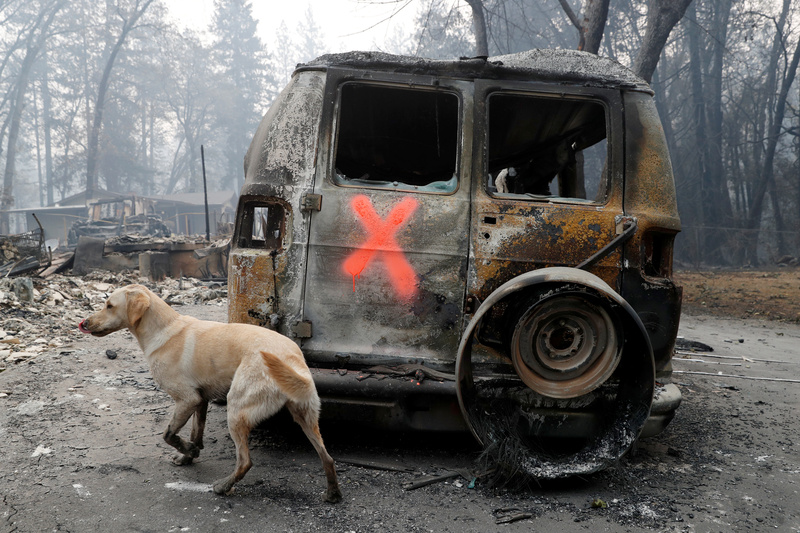 Roughly 460 searchers are working with 22 cadaver dogs to comb through wreckage from the Camp Fire and search for any human remains. The rescue effort is the largest in state history, according to officials. The cause of the fire is unknown but may be traced back to faulty utility lines owned and operated by California utility Pacific Gas & Electric Co., according to news reports. Another major fire active in California, the Woolsey Fire, has consumed nearly 100,000 acres and was 78 percent contained by Friday evening. It has killed at least two people and razed nearly 1,000 buildings, according to Cal Fire.